W. W. Norton & Company, 9780393057812, 589pp. From the New York Times food writers who defended lard and demystified gumbo comes a collection of exceptional southern recipes for everyday cooks. 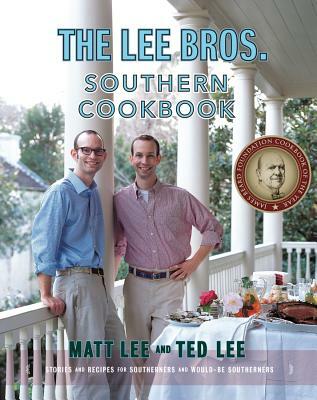 The Lee Bros. Southern Cookbook tells the story of the brothers' culinary coming-of-age in Charleston how they triumphed over their northern roots and learned to cook southern without a southern grandmother. Here are recipes for classics like Fried Chicken, Crab Cakes, and Pecan Pie, as well as little-known preparations such as St. Cecilia Punch, Pickled Peaches, and Shrimp Burgers. Others bear the hallmark of the brothers' resourceful cooking style simple, sophisticated dishes like Blackened Potato Salad, Saigon Hoppin' John, and Buttermilk-Sweet Potato Pie that usher southern cooking into the twenty-first century without losing sight of its roots. With helpful sourcing and substitution tips, this is a practical and personal guide that will have readers cooking southern tonight, wherever they live.